Gandhinagar: After getting electoral drubbing in Delhi and Bihar, winnability seems to be the only criteria for BJP in Gujarat, where delimitation has altered caste and community equations. Bharatiya Janata Party (BJP) has fielded a record 500-plus Muslim candidates, out of total 8,434 for the Gujarat local body polls. “After debacles in Delhi and Bihar, we can’t afford to lose on our home turf,” said a senior BJP leader. Mehboob Ali Chisti, BJP minority morcha president, said, “Of the record 500 candidates across Gujarat, 350 to 400 candidates are likely to win.” However, senior political analyst Dinesh Shukla calls this an extension of Modi’s Sadbhavana, at the same time he did not rule out that BJP’s softening stand towards Muslims may lead to resentment among its core vote bank,” he said. It was in 2010, when former chief minister Narendra Modi, in Sadbhavana mode, first fielded about 300 Muslims in local body polls. About 250 of them won. This time around, BJP has fielded 40 per cent more Muslim candidates. Muslims comprise a little over 9 per cent of the total population of Gujarat, according to 2011 Census data. “Not only did the experiment work last time, it helped build bridges between the community and the party. Hence, we decided to give more tickets this time,” says R C Faldu, president of Gujarat BJP. 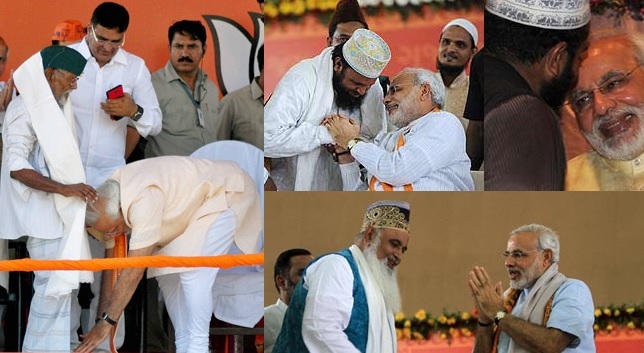 Ten Muslim candidates have been fielded from Somnath – from where BJP veteran LK Advani started his rath yatra to Ayodhya in 1990. The BJP has also fielded four Muslim candidates in Ahmedabad, six in Jamnagar and two in Rajkot for the municipal corporation elections.